I have always held the belief that there has been no period in history when women did not play significant roles as artists. Traditional western art history texts just failed to mention women who were professional artists at the time of the early American republic in favor of blah-blahing about Peale, Copley, and West. 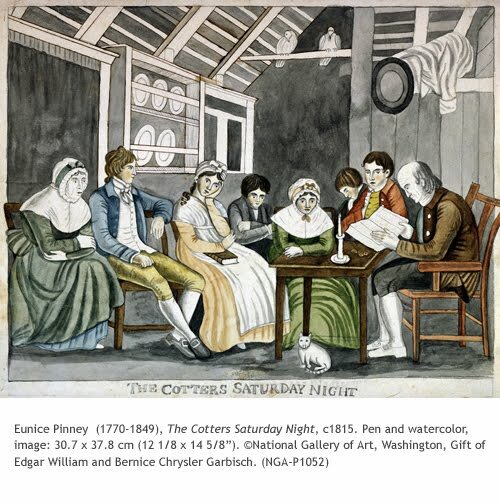 I present to you this week Eunice Pinney, the earliest known American artist whose dedicated medium was watercolor. The reason this is significant is that at the time watercolor was considered a minor medium compared to oil painting, and Pinney made her career doing watercolors. In the early nineteenth century the academy system was introduced in America to regulate artistic patronage and production. It was based on the English academy and as such established standards for training artists, although women were not allowed. However, between 1800 and 1860, many women bucked society’s restrictions on their gender and became successful professional artists. Through the nineteenth century women increasingly challenged the notion that woman’s “place” was still in the home by applying to the American academies in growing numbers. By the end of that century women were represented in all of the major artistic academies in the US. The period between 1800 and 1876 is considered a golden age for the first flowering of art by American women artists. Pinney is the earliest known American Folk watercolorist. Born of a wealthy and cultivated family in Connecticut, she and her siblings performed plays as children for neighbors. As a young woman she learned to draw and paint, although she did not begin painting in earnest until she was 39. While many well-bred women preferred painting fruit, flowers, landscapes, and scenes from history, Pinney’s range of subject matter was much broader. Of her extant fifty-four works, the majority were painted between 1809 and 1826. Because Pinney developed her art on her own, her style was independent of what was fashionable at the time in America. Compared to other woman artists who painted at home, Pinney’s style is bolder and more self-assured. This is partly due to her maturity when she began painting, and to the fact that she produced many pencil sketches to plan her compositions carefully. A woman of extensive reading, Pinney loved to paint literary subjects. Cotters was the English term used for poor, country people who lived in a cottage. The Cotters Saturday Night, based on a poem by the Scottish poet Robert Burns, is typical of her literary works. It is most likely based on an English print of the subject. Her composition is reminiscent of theater productions, perhaps recalling her childhood plays. The strong contours are evidence of her assured draughtsmanship. The poorly understood perspective of the space, flat forms, and naïve treatment of anatomy are all trademarks of American Folk artists. Always notable in Pinney’s work is the strong, balanced composition.